"Verdict – sophisticated cuisine by delightful couple Uyen and Simon @ £30 a head plus tips. 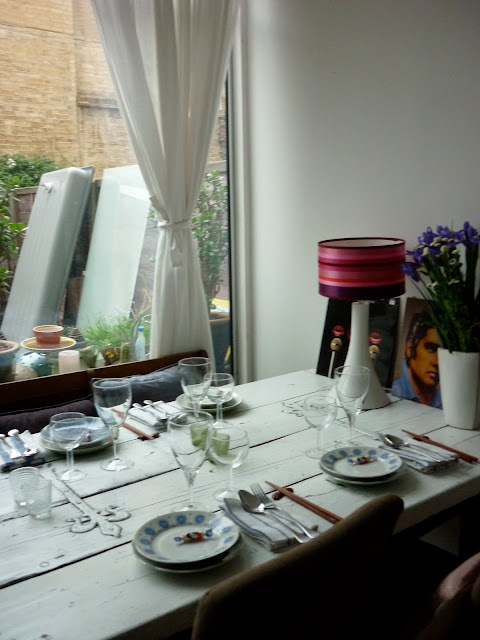 A great value supper club serving outstanding food in charming apartment in East London. BYOB with no corkage charge. One of the best London supper clubs, and highly recommended." We have great admiration for many food bloggers we have found and met in the last three months of supper clubbing. Although in love with eating out and cooking, neither Simon nor I have ever blogged about it and now feeling slightly jealous that we can not write as well or have collected photos and experiences of the great food we have eaten on our travels and in London. Last night, over Italian in a cosy new place we found on Upper Street, Islington - we promised ourselves to start writing about wonderful food and places to eat and start a wonderful collection of memories like Luiz has in his blog of places he has eaten in London. Looking and reading through - one can see true dedication and love. What a wonderful way to share the love of food! We have listed some of our favourite food blogs on the right hand side of this blog. Also check out Gastrogeek, The Londoneater, flibbertygibbet, Princess & The Recipe and Gin & Crumpets. Tom & Jen have eaten at ours twice now and every other day I tend to check out where they have been. Tom & Jen write with such wit and pace. Delicious in detail and observation. I find it fascinating that all these people have full time jobs and lives to live but live to tell and share in such eloquence and passionate ways of writing and/or photography and will be following recommendations and reading eagerly.